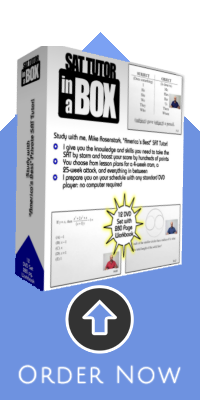 SAT Tutor in a Box is the the definitive SAT Study and Tutoring Guide. The importance of the college acceptance process relies heavily on SAT scores. The most common misconception about the College SAT is it’s a test of intelligence, and you can’t study for it. 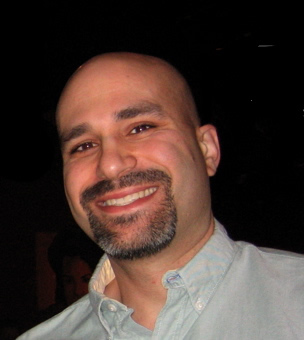 As a Master SAT tutor, Mike Rosenstark has developed a proven system that teaches the fundamentals of how the test is constructed, making the SAT conquerable by any student. 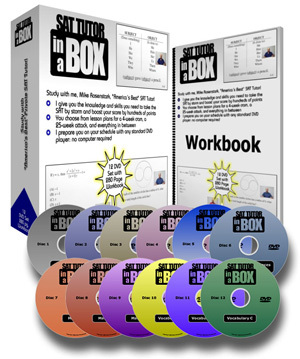 SAT Tutor In a Box is a DVD set part of a private SAT Tutoring course taught by Mike Rosenstark to students all over the United States. Mike is also available to be hired for Private SAT Lessons. Please contact him here. “My technique is not based on simple ‘tricks,’ although a wealth of information about how you can get your best score on test day is included. It’s a technical approach, focused on diagnosis, training, and retention. What people think of as ‘tricks’ are often, in reality, small changes to your test-taking that can quickly boost your score. I include dozens of these on Disc 1, The Basics. Exponents, Functions, Algebra, and more.